Rossetti Care worked with Oyo State and the Nigerian Union of Pensioners to produce a lively forum raising awareness in support of all elderly people living with Dementia in Nigeria. Twelve out of 33 honourable members of the Oyo State House of Assembly attended demonstrating the growing support for the awareness building campaign. Over 300 attended the event and representatives from the media attended to further spread the word. I was very impressed with the level of support for this initiative particularly as we had limited resources for promoting it. My thanks go to the Oyo State House of Assembly and the Nigerian Union of Pensioners who continue to show their care for elderly people living with dementia. My apologies to those who did not get the information in time and who were unable to attend. 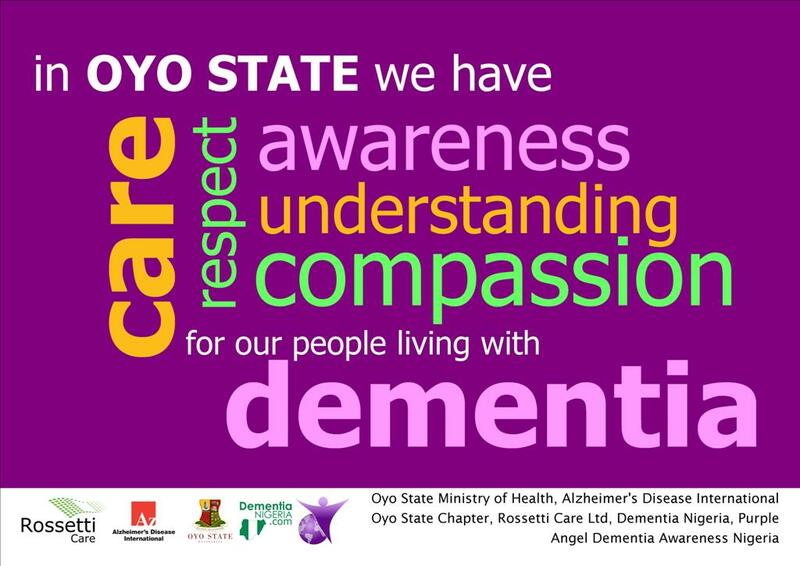 Oyo state is certainly becoming Dementia aware, and Dementia Friendly! We and the world are so very proud of the work you are doing to raise awareness of dementia and hope it spread`s over the whole of your wonderful country. Oyo is the First State in Africa to receive PURPLE ANGEL STATUS, and the others will be looking towards you wonderful people to take your example and take this forward. Please know that we here at the Purple Angel are next to your side at every step of the way and always here to help you when needed. May you be guided to carry on this wonderful work in the knowledge that what you are doing will help so very many, and for that we will be eternally grateful.